Myung Chul Choi received a B.S. in Physics from KAIST in 1998. He received his Ph.D. degree in Physics in 2005 from KAIST for his work on “Confinement Effects on Mesoscopic Structures of Macromoleules” under the supervision of Professor Mahn Won Kim (previous President of KIAS). In 2005, he joined Safinya group at UCSB as post-doc and conducted research on the structure of cytoskeletal protein derived from nerve cells. 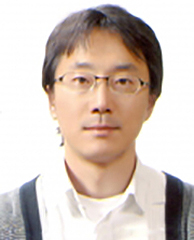 He joined the faculty of Department of Bio and Brain Engineering at KAIST in 2010. 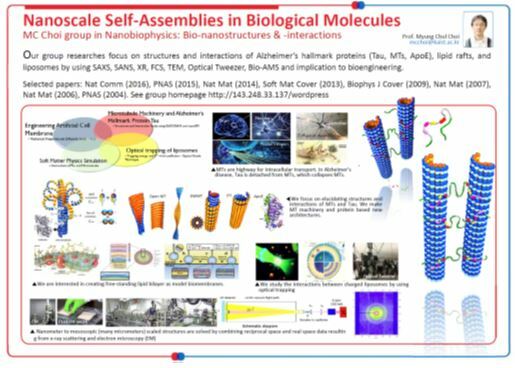 His group’s research is focused on elucidating structures and interactions of supramolecular assemblies of biological molecules. This includes a fundamental understanding of structures and interactions between cell cytoskeletal proteins and their associated molecules which leads to their distinct structures (related to their specific functions in cells) on the nanometer to the many micrometer scales. Structures are solved by combining reciprocal space and real space data resulting from X-ray/Neutron scattering, light-microscopy and electron microscopy experiments. A major project in the group has the goal of (i) understanding Structures and Interactions of Microtubules and Microtubule-Associated-Proteins (MAPs) Tau, (ii) Engineering Model Bio-Membranes, and (iii) Understanding and Control of Interactions between Liposomes Using Optical Tweezers, and Implications to Drug Delivery Systems. Cell membranes are involved in a lot of biological processes such as motility, cell division, and signal process. Despite of their importance, complexity of cell membranes hampers the study of membranes on their physical properties. Accordingly, many model systems have been developed including vesicles, supported lipid bilayers, black lipid membranes, but they all have some disadvantages. We are interested in creating free-standing lipid bilayer as model biomembranes. Once stable free-standing lipid bilayers are formed, they provide a superb model system to interrogate intriguing behaviors and properties of biomembranes in a variety of approaches. We present a new strategy to dramatically enhance the stability of freestanding lipid bilayers. We found that an addition of a water in oil emulsion stabilizer, SPAN 80 to a solvent phase guarantees nearly millimeter-scale stable freestanding lipid bilayers. 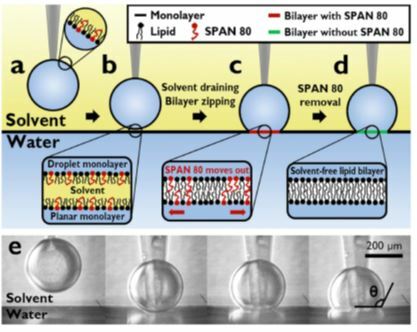 The water permeability, bilayer area, contact angle, and interfacial tension were measured as a function of time and SPAN 80-to-lipid weight ratio (ΦSPAN 80) with several different solvents. Surprisingly, the SPAN 80, instead of remaining in the bilayer, was moved out of the bilayer during the bilayer formation. Also we studied the effect of solvent on freestanding bilayer formation, and found that squalene was the only solvent that was not incorporated into the bilayer. The regime of stable bilayer formation was experimentally determined to be 3/1 < ΦSPAN 80 < 15/1, and we suggest general stability criteria for bilayer formation. This technique and the suggested stability criteria can be potentially helpful to many model membrane-based researches in life sciences, physical sciences and biomedical engineering fields.